The Niō (仁王, lit. Benevolent kings) are two wrath-filled and muscular guardians of the Buddha, standing today at the entrance of many Buddhist temples in Japan under the appearance of frightening wrestler-like statues. According to Japanese tradition, these guardians travelled with the historical Buddha to protect him. One of the protectors, Agyō (阿形) or Shukongōshin, is a symbol of overt violence: he wields a thunderbolt stick and bares his teeth. His mouth is depicted as being in the shape necessary to form the «ah» sound, leading to the name «Agyō». The other, Ungyō (吽形) or Kongorikishi, is depicted either bare-handed or wielding a sword. He symbolizes latent strength, holding his mouth tightly shut. 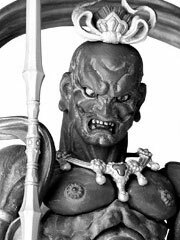 His mouth is rendered to form the sound «Un», leading to his alternate name «Ungyō». Both are manifestations of the Bodhisattva Vajrapani, protector deity of the Buddha. The Niō Protectors are part of the Mahayana pantheon and as such were probably influenced by the Greco-Buddhist interaction of Buddhism with the Hellenistic culture of Central Asia from the 4th century B.C. to the 4th century A.D. Together with the Herculean expression of Vajrapani in Mahayana Buddhism, their attributes, physical qualities and attitudes seem to get their inspiration from those of the Greek god Heracles.